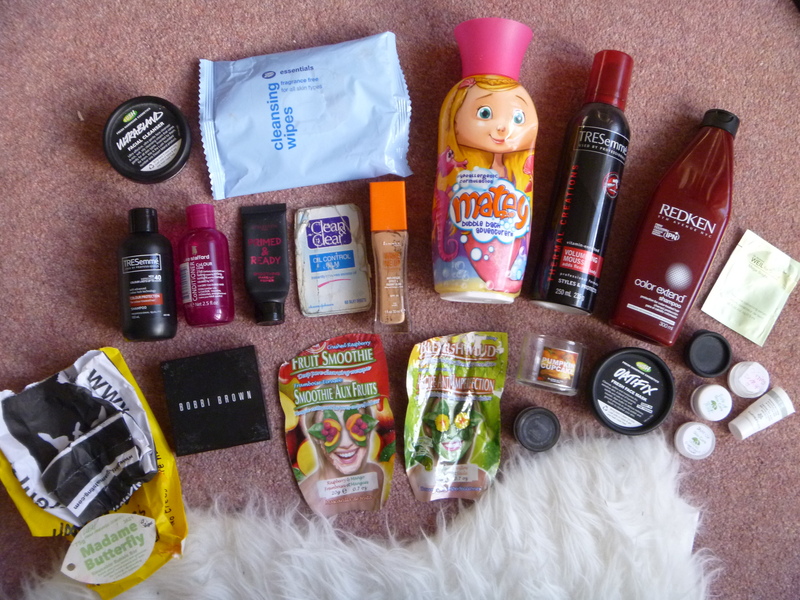 September & October 2013 Empties! | Becky Alyssa's Beauty Box. September & October 2013 Empties! After a long, hard struggle with filming my very first Youtube video and attempting to edit it..it wouldn’t work! I blame technology. I filmed it over and over and attempted to edit, but Windows Movie Maker doesn’t seem happy with my laptop and kept crashing and not doing what I wanted. So I’ve decided to leave video-ing to another time – sorry about that! In place of a video-style Empties post, here are my empties for September and October 2013! I’ve been working hard trying to use things up and cut down my makeup and cosmetics collection and find that I’m actually quite addicted to other bloggers’ empties videos and posts too! What a load of (beauty) trash! 1. Lush Dorothy Bubble Bar and Lush Madame Butterfly Bubble Wand – Only two Lush bath items? I seem to save these for ‘special occasions’ I suppose – if you, like me, take baths often it would get expensive if you used a whole bath bomb every single time! I feel very lucky to live somewhere where I can take baths in a clean environment – most houses here are shared accomodation where other bathtubs have layers of unholy muck – you wouldn’t dream of ever taking a bath there! Anyway, Dorothy is one of my favourites – a bright blue bubble bar with a rainbow on top. It apparently contains Ylang Ylang oil – my skin is always incredibly soft after using this and it’s a perfect ‘calm and clean’ fragrance for those who don’t like lavender. Madame Butterfly is a gorgeous rose-scented re-useable bubble wand – simply wave the wand in your bathtub to make bubbles! Mine ended up crumbling in the water so I didn’t get to re-use it – I ended up with a huge mountain of bubbles and emerged smelling like a rose garden. I believe this was a limited edition product for Spring/Easter time, but hopefully they’ll bring it back next year. Luckily both Rose Jam and Ro’s Argan Body Conditioner, both by Lush, share the same fragrance. Repurchase? Yes and yes. 2. Lush Ultrabland Cleanser – Yet another Lush product! This is an ideal product for when I’m wearing minimal makeup and don’t feel like washing my face before bed. I massage a small amount all over my (dry) face and wipe off with a cotton pad soaked in my B Pure Micellar Water. It does a great job of removing eyeliner and mascara without the hassle of using water and a flannel. The smell is wonderful – I’d describe it as ‘creamy honey’, which sounds about right since it contains beeswax. Repurchase? Already did. 3. Tresemme Colour Protection Shampoo – This is the mini shampoo I took on holiday last month, since I’d recently had my hair coloured and decanting my favourites is messy and time-consuming. Unfortunately I hated it – it seemed to dry my hair out horribly and even stripped the colour a little. Note to self: decant next time! Repurchase? No. 4. Lee Stafford Colour Love Conditioner – And this is the mini conditioner I took on holiday. Lee Stafford’s products are hot, translucent pink with a funky perfume scent, which you may or may not like. I am the latter person – it’s a little overpowering and synthetic for me. It wasn’t an outstanding conditioner so I’m not too fussed about it at all. If you use and love other Lee Stafford products on your coloured hair and want it to smell the same, get this. Repurchase? No. 5. Bobbi Brown Shimmer Brick in Rose – I feel I should have some kind of party to celebrate finishing this! I’ve had this Shimmer Brick since I was 14 and used it almost every day for years in a row, until I discovered other shades and types of blush I wanted to try out, so this is probably the last blush I’ll ever completely use up. I put it aside for a while and recently used it again for the start of the chilly season, but it’s pretty much all gone now so I’m going to have to part with it. These are perfect for those who prefer a really subtle blush – I blend all the colours together with a fluffy face brush and lightly dust over my cheekbones. The lighter shades act as a great but very subtle built-in highlighter, and you can use the shades separately or as eyeshadows if you wanted. This is my pick for when I want to wear makeup but still look very natural. Repurchase? My dad gifted me another last year! So I have plenty to use for now. 6. Boots Essentials Cleansing Wipes (Unscented) – I didn’t post my cleansing wipe empties last time, but I had a stockpile of these and I’m now on the lookout for something better. These are nice and affordable, often 3 for £3 in Boots. But they can be dry with very little moisture in and recently feel like they’re drying out my skin slightly. I bought a few other brands to try which I already like better, so I’ll probably use the rest of my stockpile of these for cleaning my room and hands. Repurchase? No. 7. Collection 2000 Primed and Ready Face Primer – Good old Collection 2000. This is currently my favourite primer since it smooths out my skin so nicely before applying foundation and does a decent job of keeping oiliness under control so I don’t have to reapply powder as much during the day. This is silicone-heavy which may not agree with everyone’s skin, but it dries smooth in less than a minute, so it doesn’t leave an oily residue like many similar primers often do. It’s only £6 from Boots or Superdrug, much more affordable than high-end smoothing primers. Repurchase? Already did! 8. Clean & Clear Oil Control Film – My favourite oil absorbing sheets – I mentioned them last time. The packaging gets a little gross being in my handbag for months at a time, but these are invaluable to have around if you’re oily-skinned like me. I recently bought a basketful of the similar Kleenex ones for 29p each at Home Bargains (go go go!) so those should last me for a few years at least! Repurchase? Yes, eventually. 9. Rimmel Wake Me Up Foundation in 100 Ivory – I stick to BB Cream in the hot summer months but once the chilly weather returns I’m straight back to my favourite foundations. This is my favourite light-medium coverage foundation, it gives the most subtle ‘luminising’ effect – not completely matte, but definitely won’t make even oily-skinned people like me turn into a beacon. Great for fooling others into thinking you got a good night’s sleep! This lasts excellently throughout the day over a good primer. 100 Ivory is a perfect match for my NW15-20 skin and blends seamlessly and evenly, even when just using my fingers. It costs around £8-9 anywhere you can find Rimmel products and I recommend it to everyone. Repurchase? Yes! 10. Montagne Jeunesse Fruit Smoothie and Aloe & Willow Face Masks – Again, I love these masks! Cheap, easy to store for when needed and perfect for sucking all the dirt and gross-ness out of your skin without drying it out in the least. Fruit Smoothie smells and feels like apricot yogurt, whilst Aloe & Willow is an ideal calming mask for sensitive skin – both left my face very soft and my pores clear. I’m hoping to find somewhere that sells the bottles of these for cheap so I can make my face mask habit a little more affordable. Repurchase? Yes! 11. Matey Bubble Bath – What can I say? I’m a giant kid, obviously. This mega-bubbly bubble bath smells like berries, produces tons of bubbles and is extra-gentle on my sensitive skin. And it’s around £1 for a big bottle. My go-to bubble bath when I’m not using my Lush bars! Repurchase? Yes! 12. Tresemme Thermal Creations Volumising Mousse – Another product that seemed to take forever to finish, since I only wash my hair once or twice a week. Using frequently in rotation, I think this took me around a year to use up?! It gives brilliant volume to my flat, fine hair without being too sticky or crunchy. They’ve changed the formula recently – why constantly change a good thing, cosmetics companies? – but it still seems to feel and work just the same for me. Repurchase? Already did. 13. Bath and Body Works Pumpkin Cupcake Mini Candle – After owning & saving this for a year, I only just used it up last night. I only tend to use candles in winter, they’re so comforting during the cold rainy weather. Pumpkin Cupcake is my absolute favourite Autumn scent – savoury with a touch of sweetness to make it pleasant but not overpowering. It’s less spicy than most Autumn candles and reminds me of delicious pumpkin pie! Everyone I know seems to love the scent when I’m burning it. I just wish we could get Bath & Body Works candles in the UK without paying a small fortune! Unfortunately these mini candles don’t last long, since I’ve only burnt it a few times and around 1/4 of the wax still remained at the end since the wick broke off, which felt a little wasteful. I used the very helpful tutorial at Water Painted Dreams to clean out the jar so I can use it to store my cotton buds – I’ll press the leftover wax into the new candle. I already bought another small one last month in the USA but I’m so hooked on this scent I’m sure it won’t be long until I need the large version and end up paying a small fortune on Ebay – oh B&BW, please come to the UK already! Repurchase? Yes. 14. MAC Blacktrack Gel Eye Liner – Unfortunately this dried up on me before I got to finish it! At least I can use this for Back To MAC and save it up towards a free lipstick. This used to be my HG eyeliner, very creamy and smooth to apply, but since discovering the much cheaper Essence gel liner in the USA that works just as well I’m sticking to that for now. Repurchase? No – too expensive. 15. Redken Color Extend Shampoo – My favourite shampoo to use on recently coloured hair. Red hair like mine is notorious for fading and this really does help the colour last longer so I can go longer between (expensive) appointments – it pays for itself! The lather isn’t brilliant so you have to use more than with most shampoos, but as I like to rotate my haircare products this lasts many months at a time. Repurchase? Yes! 16. LUSH Oatifix Fresh Face Mask – A freebie from bringing back 5 black pots. Wanting to venture away from my favourite BB Seaweed and be a little more adventurous, I chose this. It smells incredible, like bananas and really delicious creamy porridge. Unfortunately I forgot about it before going on holiday and once I returned home it had dried up. It wasn’t anything impressive on my skin – it didn’t unclog my pores and just kind of sat on my face smelling tasty. I can imagine it would work well to soothe irritated skin but it didn’t really do much for me. Repurchase? No. 17. Dr Weil for Origins Mega Bright Serum – This lasted a couple of uses. Very similar to my Mega Bright moisturiser, but with a lighter consistency. It does work well to combat redness a little and absorbs very fast without being greasy at all. Shame the full size is £46..eek! Repurchase? Already bought a mini tube from Ebay! Maybe the full size when I’m feeling rich. 18. Lush R&B Hair Moisturiser Mini Pot – A leave-in conditioner. This smells very strong and may not be to everyone’s tastes, but it lasts for ages and does a pretty good job of moisturising the ends of the hair. A warning: do not apply more than the tiniest amount, as otherwise your hair will feel coated and greasy. I bought a big tub for £2 at the car boot sale, but it’s not an HG for me so I’ll try something else next time. Repurchase? Probably not. 19. Origins Drink Up Overnight Mask x3 – Somehow I acquired 3 mini sample pots of this! I used them up on holiday as well as on the plane each way so my skin didn’t have that horrible dried out feel after my journey. This is a wonderful heavy duty overnight moisturiser to use once a week to hydrate skin without it feeling greasy. Repurchase? Yes. 20. REN Frankincense Night Cream Mini – I wasn’t a fan of this until I noticed how soft it left my skin the next morning. The smell is a little strong but it’s the best night cream I’ve used that doesn’t make skin greasy at all. Again, I used it all up on holiday on top of serum at night or on its own – it works very well either way. Repurchase? Already did! What a long list of empties again! After returning from my break in the USA at the start of this month I came back with much, much more makeup and beauty products so empties will definitely be an ongoing thing in order to keep my evergrowing collection under control and to tell you all about what products I really love and dislike after having a good use of them. Time to recycle these and start collecting again for next time! What have you used up lately? Link your empties posts and videos below, I’d love to check them out!